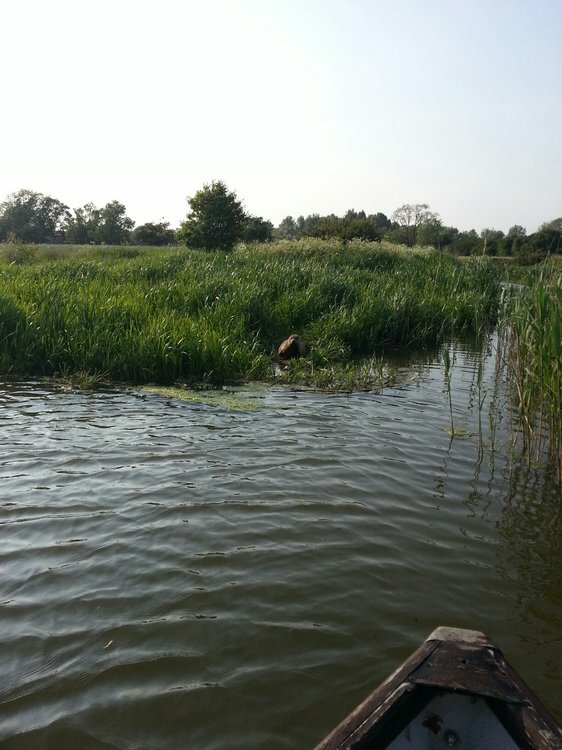 I wasnt expecting this when i went for an early morning fishing session on the great ouse in my favourite swim. Not good news for that part of the river. what is it ?...is it one of them south american rat looking things ? Specsavers for you my boy. you tease, wot is it ..............please.....its not a seal surley ? It's an OTTER and who is Shirley, one of fat Sarahs friends? Darn huge otter that thing. It’s got the shoulders of a heavy weight boxer and the belly to match ( like fat Sarah ). Unless it’s about to pup it’s a seal and why not on the Gt. Ouse? When otters are in pup they are really skittish and don’t pose for anyone. Doesn't he know it's the close season????? Who the seal or Dad? Well looking at the vegetation I would say that the photo was taken in the summer. I took it was a trip out this morning, my mistake!! It was in the summer ate most of the big bream and pike had a mate too. I only just learnt to post pictures. What sort of boat are you in ? Only seen the odd one on our waterways, but I am pretty sure you only see a percentage of what is really there , with having very few enemies ( apart from man ) there is nothing more surer they will keep multiplying in good numbers .